Col. Thomas W. Ferebee, the bombardier who dropped the atomic bomb on the Japanese city of Hiroshima in World War II, died on Thursday, March 16, at his home in Windermere, Fla. He was 81. At 8:15:17 a.m. on Aug. 6, 1945, Colonel Ferebee, then a 26-year-old major, pushed a lever in his B-29 bomber, the Enola Gay, making sure an automatic system he had activated seconds earlier had functioned. He watched as a single, 9,000-pound bomb turned nose-down and fell toward its target, Aioi Bridge, which he had personally selected from aerial photographs. He said, "Bomb away!" and 43 seconds later, when the bomb had fallen from 31,000 feet to 1,890 feet above the target, the sky erupted in dazzling light, and the earth soon seemed to seethe like boiling liquid. The bomber, also called a Superfortress, veered away from the swirling explosion in a steep, 150-degree turn. At least 80,000 Japanese were killed instantly or would eventually die as a result of radiation from the explosion. And the atomic age was born. The bombardier napped on the way back to the air base in the Mariana Islands, just as he had on the flight to the target. He had been asleep two hours earlier when the pilot, Col. Paul W. Tibbets, who had named the Enola Gay after his mother, first told the crew they were carrying an atomic bomb. Upon returning to the base, the two officers and the 10 other members of the crew were greeted by numerous generals and admirals, and immediately presented with military decorations. Three days later, a second nuclear bomb was dropped on Nagasaki, Japan, and five days after that the Japanese government surrendered, ending World War II. With the passage of years, the crew that had been hailed as heroes and national saviors became the subject of a complex debate as moral and political questions were increasingly raised about the use of the bomb. They included whether an invasion of Japan really would have cost a million American lives, as feared, and whether Japan would have surrendered if the atomic bombs had not been dropped. Adding fuel to the debate were reports in the 1950's and 60's that a pilot named Claude Eatherly, who had flown a B-29 to scout weather conditions over Hiroshima in advance of the Enola Gay mission, felt remorse about the use of the bomb. The persistent fierceness of the debate was evident in 1995, when the Smithsonian Institution's National Air and Space Museum in Washington pulled back from exhibiting the Enola Gay in conjunction with a World War II exhibition; the plans were scrapped in favor of a more neutral exposition. In speeches, interviews and comments at autograph-signing sessions he attended in recent years, Colonel Ferebee never shifted from this position. But he began warning against the dangers of nuclear destruction, and used his own experience as a lesson. Thomas Wilson Ferebee, the third of 11 children, was born in 1918 and grew up on a farm outside Mocksville, a town in central North Carolina about 20 miles southwest of Winston-Salem. He attended Lees-McRae College in Banner Elk, N.C., where he won letters in track, basketball and football. A knee injury while playing football kept him out of the infantry in World War II, so he joined the Army Air Forces. After two years of flying school he was assigned as a bombardier. Max Morgan Witts and Gordon Thomas, in their book "Enola Gay" (Stein & Day, 1966), described the then-Major Ferebee as "rakishly elegant." He was 5 feet 11 inches tall, sported a mustache that made him seem older than his 26 years, and was a crack poker player. He and a friend from flight school, Theodore van Kirk, a navigator, were assigned to the same bomber crew in England. Colonel Tibbetts, then a captain, was the pilot. They flew together on the first American bombing mission over Europe; successfully attacked the German-held oil fields of Ploesti, Romania, and led the first bombing runs over North Africa. Eventually, they were selected by Captain Tibbetts for the secret project to drop what they were told would be a devastating bomb on Japan. Captain Tibbetts, by then a colonel, called Major Ferebee "the best bombardier who ever looked through the eyepiece of a Norden bombsight." 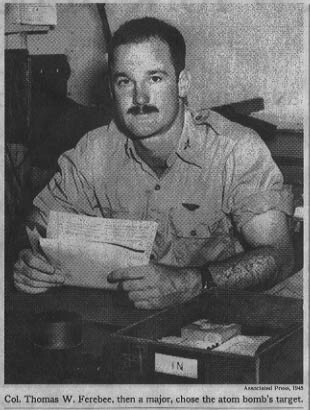 As head of the 509th Composite Group, Colonel Tibbets, who eventually retired as a brigadier general, commanded 1,800 men who practiced B-29 runs under extraordinary secrecy in a variety of places. A problem emerged during bombing practice at the Salton Sea testing range in Southern California: Major Ferebee kept missing his target. The reason was that at the critical moment when the bomb was released, Major Ferebee lifted himself off the seat to bring his eyes to the sight. But the greater height needed to drop the atomic bomb without also blowing up the plane meant the chance of error was magnified. Colonel Tibbets' solution was to fit a padded headrest to the bombsight. Major Ferebee's head was forced into exactly the same position each time. From then on, he bombed with accuracy. In the summer of 1945, the 509th Composite Group were sent for additional training to Tinian, a small island in the Marianas captured from Japan in 1944. The men were not told that it would be the embarkation point for their historic mission. But after Japan ignored an unconditional surrender demand issued by the Allies in July 1945, the United States made plans for a strike on Hiroshima, a city of about 300,000 people. It was chosen as a target because it served as the headquarters for Japan's Second Army, , which was planning the defense of southern Japan from the impending American invasion. After World War II, Colonel Ferebee served as deputy wing commander for maintenance of several B-47 Stratojet commands. He was triple-rated as a bombardier, a navigator and radar operator, and he served on B-52's in the Vietnam War. Colonel Ferebee's decorations include the Silver Star, the Legion of Merit, two Distinguished Flying Crosses, the Bronze Star and the Air Medal with 13 oak leaf clusters. After leaving the Air Force, he worked in real estate in and around Orlando, Fla. He is survived by his wife of 19 years, Mary Ann Conrad Ferebee; four sons, Thomas Jr., Clinton, Robert Steven and Robin; five sisters, Annie Lois Simpson, Maxine Pruett, Katherine Loudermilk, Lou Bailey and Amanda Wilkinson; two brothers, William and Joseph, and five grandchildren. Kermit Beahan, the bombardier on the Nagasaki mission and the only other person to drop an atomic bomb in wartime, died in 1989.